Shell after her swimming lesson. Street tacos... ohh so good. Navy women look on as the parade makes it's way down the Malacon. Cute little girls riding side saddle in the most elaborate dresses. Cat-2-Fold anchored at Isla Partida. More parade pics from La Paz. A look at the Isla Partida anchorage from 1200' above. Kathy scales the cliff band high above the Isla Partida anchorage. Easy going up, but not quite so easy on the way down. Dave near the top of the peak to the East of Isla Partida anchorage. Kathy taking a breather on the decent through the cliff band. This pitch required some semi-technical down climbing. Kathy planning our next adventure in the Sea of Cortez. Beer truck has arrived at San Evaristo a week over due. We waste no time enjoying a almost cold beer with the crew of s/v Deliberate Simplicity. Tienda (small shop) or Mini Super in the tiny village of San Evaristo requires careful navigation to avoid the hazards. Shell takes her turn at the helm. If cats could talk I think she'd be screaming "hold on, helms a lee". Abandon salt drying machinery near San Ysidro. Ok, this one was a big surprise. This is the lower jaw bone of a ORCA whale. We found the head and lower jaw, but someone had pulled the teeth. Can anyone identify this skeleton? Is it a snake? IF so what is it doing on the beach near San Ysidro? Ridge hike on Isla San Francisco. Isla San Francisco from the ridge above. Kathy on promontory of Isla San Francisco. Cactus bloom after a bit of rain. Is this Mexican snow? No, just abandon salt ponds on Isla San Francisco. We took a small bag of this sea salt home and will be using this in our salt grinder. A view from the port side looking aft and towards the starboard side. We also had a few sets of slip covers made to keep the cat from tearing up the new Ultra leather. Even a set with a South Pacific theme. Location: San Evaristo, Baja Sur, Mexico. Lots to report as we've been super busy. Our stopover in La Paz to have new settee cushions stitched was a certified success with the project completed ahead of schedule and within budget. Thanks to Francisco Rodregez for the job well done. Be sure to check out pictures of our new cushions once we get some internet. La Paz is a great meeting spot, just tune in to VHF channel 22 at 8AM for an hour long cruisers net with tons of information for the goings on. Bumping into friends around town is the norm and these chance encounters lead to all sorts of new discoveries, great shops, restaurants and street taco stands. It's easy in La Paz. A few highlights from the past week include: Helping out our friend John get his boat into Marina La Paz late one evening after he had a long day stuck on a sand bar with a line wrapped on his prop. Lots of street taco evenings. The generosity of s/v Michaela in recharging our cockpit refrigerator for Margaritas. Hiking 1200 feet to the top of the ridge above Isla Partida and some pretty sketchy down climbing off the cliff band that seemed not so scary on the way up. And a chance meeting with the founders of our favorite www.Shoppeople.org from Portland, Oregon. The best snorkeling experience perhaps ever; Swimming with Sea lions at Los Isolates just North of Isla Esprito Santos. All we can say is WOW!!! Sea lions so close their whiskers brush your face and escaping with only a nip on the flippers... look for the videos soon, as no words can describe this encounter. Anchored at Isla San Francisco last night and climbed the South West Ridge of the bay for some great views, then circled around the bay to chip some salt out of a sea salt pond. Sailed up to Bahia San Evaristo for the evening and met some interesting ex-pats sailors Steve and Charlotte aboard s/v Simple a 27' Catalina whom call the bay home 8 months a year. Had a few cold beers on the beach for 15 pesos each before heading home after sunset to cook up a Thanksgiving dinner of Mahi Mahi with sides of wasabi mashed potatoes, broccoli and desert of homemade tapioca pudding along with a chilled bottle of Spanish cava. Wow! We've been super busy since arriving in La Paz. The moment we hit the dinghy dock at Marina La Paz (15 pesos for dinghy parking, garbage and water) we met the crew of s/v Eyoni (Ethan, Nancy and 6 year old Zada) who we joined for a walk to the Saturday market. We were a little late for the market, but under the guidence of s/v Eyoni we were shown some of the key areas of town including one of the best street side taco stands in the city. From there we made a few loops around looking for a reasonable place to drop off our laundry. With that accomplished we headed to the grocery store for a few staples like wasabi for some freshly caught Mahi Mahi. Dropping the groceires on the boat we headed back to town for dinner and some great tacos with amazingly hot hot sauce and a few beers for next to nothing prices. It sure is great to be back in Mexico. Heading back to the boat we found the wind and tide opposed and our catamaran was not playing nice with the neighbooring monohulls that had anchored nearby while we were away. One unatteneded boat was banging away at our stern and we had a broken lifeline. I held the bow pulpit of the neighboor boat while Kathy got LightSpeed started and we pulled anchor moving to the far edge of the anchorage. Our Sunday was pretty busy as well with several boat projects checked off the list shortly after breakfast. One of the nasty ones was changing an old sewage hose, but even that nasty job went smoothly. The other necessary job was splicing a new spectra lifeline in to replace the one broken by the previous evenings 'La Paz Waltz'. From there we headed to town to pick up our laundry with the intent to have lunch around noon. However, we seemed to bump in to new friends and old for the next few hours and it wasn't until three that we finally got going to lunch with s/v Artic Tern III (John and Karen) at a local lunch spot, now gearing up for dinner. We ran into several other boating friends at the restaurant and chatted them up just as it was starting to rain. All day the clouds had been threatening, but this is La Paz and it only rains 6 inches a year the locals said no way. And then we had this incredible rain storm that had us running back to the boat to close the hatches. From there we headed to birthday party on s/v Third Day in celebration of Nancy's 50th birthday (s/v Eyoni) where we met tons of new boaters and had a great time. Today being Monday we had some business to attend to. The primary goal was to find a great upholstery shop here in La Paz to get started on our 'new settee' project. Armed with a list of service providers thanks to 'Club Cruceros', a local affiliation of boaters, we jumped in a cab and headed deep into town to find the upholstery shop of Tapiceria Rodriguez at Jalisco y H de la Independencia. Being a little ahead of the flood of cruising boats descending on La Paz we were lucky to find the shops backlog quite modest and arranged a shipboard consultation for Tuesday. Heading back towards the boat on foot we tried to locate a Veterinarian so we could take 'Shell' our 3-1/2 month old kitten in for a check up and some booster shots. Along the way we came across the shop of 'Katty' who specializes in Lycra swim suits and in particular full body Lycra suits to protect those with fair skin and from jelly fish stings. So Kathy and I both ordered custom fit full body suits for $490 pesos each. We think this a wise investment with since we really love to swim and sometimes might spend several hours a day in the water. From there we stopped to enjoy a refreshing liquado which is a blended drink made from fresh fruit or in the case of today I tried out a Cucumber liquado which was delicious and likely very nutritious. Kathy went for a more traditional flavor of Papaya blended with milk and ice. Next stop was the Veterinarian where we stopped in to see about the shots for the kitten. He said no problem, just bring her in between the hours of 9:30 -1:00 or 3:30-7:00 the classic afternoon break for a siesta. Being highly effective cruisers we hustled back to the boat to grab the cat and then hustled the many many blocks to get there before siesta time. The vet was awesome and a real 'cat whisperer' who had the nervous kitten purring as he gave her the shots. Cost: a reasonable $420 pesos. Heading back to the boat to drop of the kitten we then turned around to head in for lunch. It was now close to 2:00pm and we were hungry, tired and hot as we tried to find a new great lunch spot. With tired feet we stumbled into a great local spot and enjoyed some delicious food and then headed directly back to the boat for our own siesta. Another productive and busy day behind us we are enjoying a quiet night aboard LightSpeed. 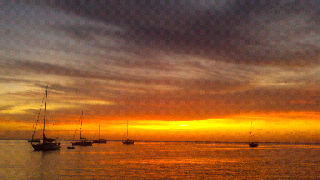 Dropped anchor in La Paz (lah-PAHS) the state capital of Baja California Sur. La Paz translates to "peace" in Spanish and based on a morning walk around town we agree. It seems that "old Baja" has been preserved La Paz which is region's commercial, cultural and political center. Alternating winds and currents in anchorage create conditions known as the "La Paz Waltz" as boats dance around. Excited to explore more of the city and attend to basics like laundry a little shopping and finding a upholstery shop to work on our new settee cushions. Cactus and a very dry desert landscape. The city of La Paz located about 30 miles to the West receives about 6 inches of rain per year. Kathy stops to smell a very lonely bright yellow flower on a bush that appears to be dead. Beach at Ensenada de los Muertos looking toward the SE. El Cardon restaurant/bar is located in the bight on the right. Dave on the beach at Ensenada del los Muertos. Pangas with ouboard motors covered with Mexican blankets. First Mahi Mahi of the morning. This one was a 'cow' or female. Notice the forehead is more rounded than the male Mahi Mahi below. This female was carrying immature eggs that our cat greatly enjoyed eating. Our second Mahi Mahi for the morning. This one was a 'bull' or male which can easily be identified by the more blunt shape of the forehead. 36" from nose to fork in the tail and 15 pounds on our scale. 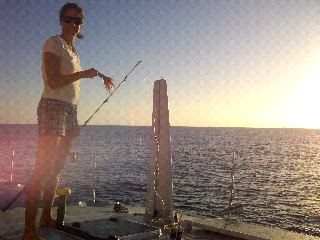 Kathy prepares a lure shortly after sunrise. Low on fish so hoping to catch a mahi mahi today. Great sunrise. Waiting out strong North winds here in Ensenada del los Muertos for at least another day. Temps only 78 F today, but water a very nice 84 F. Superb beach with nesting sea turtles and two beach bars. A quick sample of multi-hulls that participated in the Baja Ha Ha 2011. These boats represent a huge cross section covering extreme performance to extreme luxury. s/v Drei - Corsair F31 trimaran. s/v Cat2Fold - Very unique 36' x 24' folding trailerable catamaran. Afternoon sail out of Cabo San Lucas aboard s/v LightSpeed with friends from s/v Michaela, s/v Arabella and s/v Ventured. s/v Cat-2-Fold near Lands end near Cabo San Lucas. Steven, Shawn, Erlin, Jenn and Jeff aboard s/v LightSpeed anchored at Cabo San Lucas. Today we made a 45nm hop from Cabo San Lucas to Los Frailes anchorage which is about 1/3 of the way to La Paz on the Eastern side of the Baja Peninsula in the Sea of Cortez. Winds started light then filled in out of the NE providing some great windward sailing with boat speeds hitting the 9 knot range. When the wind dropped significantly we motored for a few hours into some nasty chop fueled by a 'Norther' blowing further up the Sea of Cortez. We raised sail about 6nm out of the Los Frailes to take advantage of the superb weather and flattening seas, sailing the final miles. Sailing into the anchorage, we furled the jib, went head to wind and dropped the anchor and mainsail simultaneously. It's good to sail! Kathy takes in the sights as we sail past 'Lands End' and the 'Arch' near the Cabo San Lucas anchorage. See the guy jumping from the spreaders? In a few hours the nearly empty anchorage would be packed with over 100 Baja Ha Ha boats. Add in jet skis, water taxis and a few cruise ships and the anchorage gets pretty wild.